OPTIMISM IS RIDING HIGH AS THE ICONIC CASUAL CHAIN GROWS ONCE MORE. Paul Mangiamele likes to say, customers didn’t give up on casual dining; casual dining gave up on customers. You could also argue restaurant pundits and professionals across the nation gave up on Bennigan’s. The Norman Brinker-founded brand was left for dead in 2008 when it underwent one of the most sudden—and spectacular—collapses the industry had seen. The rare Chapter 7 bankruptcy filing shuttered all 150 of the company’s corporate units. There were 138 franchises hanging on, but many of those closed shortly after. Seventy remained during proceedings, and Bennigan’s continued to shrink to the 15 domestic locations it has today. The main difference between Chapter 11 and Chapter 7 is that, in the latter case, the company is so far in debt that it can’t continue operations. Often called “liquidation bankruptcy,” this is why Bennigan’s collapse was so swift and dramatic. But one thing that took place during bankruptcy kept the brand’s pulse beating, faint perhaps, but still going. When Atalaya Capital Management bought the brand out of bankruptcy in 2008, Mangiamele, a restaurant veteran with three-plus decades of experience, was recruited by investors to lead Bennigan’s turnaround. One thing about Mangiamele, formerly president and CEO of Salsarita’s, is that he wasn’t a comeback specialist looking for one success so he could résumé jump to another. He truly might be the biggest Bennigan’s fan this side of a Monte Cristo. In fact, in 2015, Mangiamele, along with his wife, purchased the iconic chain, as well as Steak and Ale—Brinker’s 1966 creation that was wiped out overnight by the filing—from Fortress Investment Group. The move signaled the birth of Legendary Restaurant Brands LLC. Paul Mangiamele bought the company in 2015. This past year, Bennigan’s opened three U.S. restaurants: Steubenville, Ohio; Mandan, North Dakota; and Monahans, Texas. All three are experiencing double the sales volume of legacy units in a box that’s about half the size of the original 10,000-square-foot prototype. There are 18 international units as well. 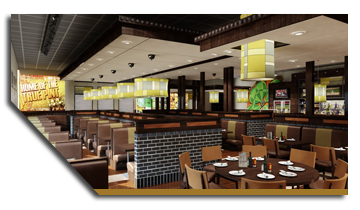 Bennigan’s executed a master franchise agreement with the Baila Group of Companies last year to expand into four major cities in the Islamic Republic of Pakistan. Other overseas locations are planned for Guatemala, Honduras, El Salvador, and Amsterdam. In total, Mangiamele says, more than 100 Bennigan’s are in some stage of development. Same-store sales are tracking positive, too. After an initial burst, they’ve leveled out to about 3 percent, year-over-year. From a compounded-annual growth rate, average-unit volumes are tracking 40 percent higher since Mangiamele jumped in. As you can see from 2018’s openings, Bennigan’s current growth chart is centered on small markets with large trade areas. Instead of starting in big cities and moving out, Bennigan’s is debuting in smaller cities and coming in. There are a few reasons for this but it all returns to unit-level economics and profitable franchisees, Mangiamele says. It’s cheaper land. More affordable rent. A quicker return on investment. The trade areas expand from a few blocks to 20, 30, 40 miles, “as soon as we open the doors,” he says. One of the challenges faced by casual brands nationwide is the proliferation of convenience-driven options into the restaurant marketplace. Impulse diners simply don’t flock to sit-down chains like they used to. Look at the mall dynamic, for example. Brands like Maggiano’s and The Cheesecake Factory have weathered the retail crisis because they serve occasions, not foot traffic. Customers are targeting these brands, for birthdays, rehearsal dinners, nights out, instead of making a lunch-time decision to drop in. Opening in a small market can mirror the effect, Mangiamele explains. Past being a brand of choice, Bennigan’s immediately becomes an employer of choice in these small markets. Staffing is currently facing one of the most challenging dynamics in restaurant history. Restaurant employment has grown by more than 1.8 percent, year-over-year, during the last two months, according to TDn2K. However, the number of vacancies that need to be filled because of turnover continues to rise. In December, the U.S. jobless rate rose to 3.9 percent from a 49-year low of 3.7 percent the previous month. That tightened market isn’t quite as laced up in some of these smaller towns, Mangiamele says. You don’t run into the ultra-competitive workplace battle you see in larger cities, where incentives, like flex hours and other gig benefits, are as valuable as dollar figures. When Bennigan’s drops down it creates a stir from the consumer to the worker to the operators. Bennigan’s small-market strategy is paying off big. Another reason this has been successful is that Bennigan’s remains selective in finding savvy, local entrepreneurs who are as passionate about the brand as Mangiamele is. Or at least in the same universe. In underserved markets, these operators know the lay of the land and how to market, and how to embed the brand into the community well past grand opening. Mangiamele says if you look at the company’s franchise disclosure documents, one thing is missing: litigation with franchisees. So what about some of the buzzier trends out there? Let’s take off-premises for example. Mangiamele says, simply, that casual dining lives and dies by a pretty straightforward premise: hot food is hot and cold food is cold. That’s the No. 1 commandment. Failing on that target has caused Mangiamele to be a bit hesitant on delivery. But he’s not ready to ignore it. Bennigan’s has worked on creating a menu that makes sense for the space. Deliberate choices like offering cold sandwiches and, instead of French fries, stocking bags of potato chips. Additionally, making sure they have canned soda in the back to give to take-out customers instead of fountain drinks. “We have a mission and a purpose. And the purpose is to live our brand 25/8. And to deliver flawless execution to go above and beyond the call of duty.” — Paul Mangiamele, CEO of Legendary Restaurants. Bennigan’s rolled out a catering initiative “that’s working very well.” And has different, in-house, big-party initiatives to satisfy larger events. One casual-dining phenomenon lately has been higher check averages offsetting traffic declines. Or the opposite: value-based incentives driving traffic while cutting into franchisee’s profit margins. In Bennigan’s case, Mangiamele says, the chain has never tried to win on price. He fears the result of getting locked into discounting, and losing the key. Bennigan’s instead works on value, he says. Value not in low price points but in abundance. The portions are large on purpose, Mangiamele says, so guests walk out with enough food for lunch. Then the sentiment becomes: this was a great deal, even if it cost $14. “OK, you now have two meals that cost you $7 each. Try to go to a fast-food place and get something similar. It doesn’t exist,” Mangiamele says. He adds that, in his opinion, deep discounting cheapens the value of a brand. It creates confusion on the store level. Most traffic increases you see in full service these days? It’s because of delivery, Mangiamele says. Bennigan’s Monte Cristo is world famous. Mangiamele says the restaurant industry is a fierce fight for market share, regardless of the category. You can work on everything, food quality, food safety, training, and so, and still break down. Mangiamele, in response, likes to keep the company’s mission statement simple and easy to comprehend. “I’ve been lucky enough to stand on Norman Brinker’s shoulders and represent the only two brands he created during his career. I think that’s cool as hell,” Mangiamele says. Corporate longevity has helped Bennigan’s guard those traits and promote company pride. Shawn Finn, the company’s VP of operations, has been onboard since 1987. Its VP of supply chain and administration, Deanna Alder, since 1989. The average tenure at Bennigan’s, Mangiamele says, is more than 16 years. Bennigan’s has seen tremendous response overseas, Mangiamele says. The Middle east, South America, the chain continues to sign master deals with the intention of growing rapidly in new markets. Mangiamele says the demand for U.S. brands remains strong, and being flexible helped Bennigan’s thrive early on. About 10–15 percent of the menu can be curated so that Bennigan’s doesn’t end up trying “to out-local the locals,” Mangiamele says. “I think a lot of other brands have made that mistake,” he says. You’re bringing your brand over but you’re trying to out-local the locals, which is a really bad idea. Bring an aspect of the local instead. Not only the cuisine and the menu, but even the way the restaurant is built.” One example is specs and sourcing. Whenever it makes more sense, Bennigan’s gets product. There’s no strict set of guidelines that stall the operation. A Larnaca, Cypress, restaurant, for example, sources meat from New Zealand.